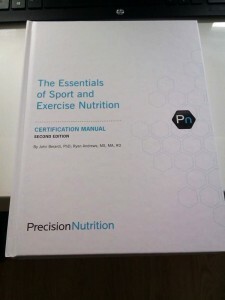 Today sees me beginning the Precision Nutrition course on the essentials of sport and exercise nutrition. This is the most recommended and highly rated course in the industry for nutrition, so I am looking forward to getting my teeth into it over the next few weeks. “Beyond honesty, good nutrition also requires results. If one of your clients thinks they are doing a good job, yet have no results to to show for it – how good is the job they are doing? Not very. This is the definition of outcome-based: you evaluate the ‘goodness’ of a client’s nutrition plan by observing what happens once your client follows it. In an outcome based world, theory is meaningless and results are everything. Your client shouldn’t believe they are doing a good job based on what they’ve read in newspapers and magazines, what they have seen on TV, etc. They can only judge their plan based on the results their diet consistently produces. If you’re not forging great health, energy and results; something needs to change.